Is haptic feedback the holy grail for VR? Students at Rice University, a research university in Houston, have made some really cool progress on the problem of touch in virtual reality. Their haptic gloves, the Hands Omni, use inflatable bladders to simulate the sensation of touching something with your hands. They're not saying exactly how the gloves work, because it's "top secret." But you can watch a small demonstration in the video below. "Our system's designed so that when you're walking around a world and you see an apple in a nice video game or a grenade in a military video game, and you want to pick it up, you can reach out and it actually feels like you're touching a physical object," mechanical engineering student Thor Walker says. 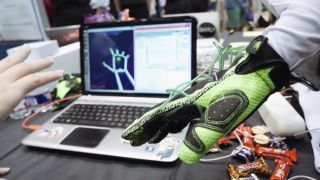 The researchers created the gloves with help from sponsor Virtuix, the maker of the Virtuix Omni, a VR treadmill for moving around in virtual worlds. The big shots of the virtual reality industry, including Oculus VR, aren't blind to the fact that better controllers are needed, but so far they haven't shown off anything usable themselves.